Risk assessment planning is a fairly straightforward process and the HSE have made it as simple as possible, Learn about this process or complete courses. It is a very simple step by step. 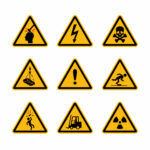 Identify the hazards, who might be harmed, some form of an evaluation. Then with the control measures, can I eliminate, reduce or control it to a low level. Record the findings and review as and when needed. Now, when we break down the whole purpose of a risk assessment, is to ensure that the workplace is safe. Perhaps the most critical part of it is not only identifying the hazards but then how do we manage them. Many will use what is known as the risk matrix where it is a simple five by five method, where we are looking at both the likelihood of the hazard actually occurring and the severity of the potential injury or damage. But when we are working at height, there are a number of aspects that we also want to link in with the risk assessment. Can we avoid working at height? If we do not have to do it, then do not. If though we need to, how can we prevent anyone from falling? There are a number of methods we could use, including the equipment. If it is we have to work at height, and we know the potential fall will exist, then there are measures we can do to minimise the distance and the consequences. So certainly, when it comes to risk assessment, there is a lot involved and now we are going to look at the way in which we can put in a whole range of control measures to ensure we do the job safely.